Adding a few keywords to your site may seem like a quick fix to get more traffic. But if you’re looking for overnight results, you’re going to be unhappy with the way things turn out. In order to see noteworthy improvement in your number of visits, you have to commit to a long-term strategy that involves a lot more planning and effort. To help understand the process, we’ve divided up the overall strategy into three major categories of SEO tactics that lead to real results. The most important step you can take is to start drafting loads of great content. If you’re new to content marketing, it takes the equivalent of 50-80 quality blog posts before you see a meaningful increase in web traffic. For ideas on where to start, see if you can answer the most common questions related to your industry, and build your content around keywords your target buyers use in their searches. This will lead them to your site and help you build clout as an industry expert even before they’re ready to buy. More importantly, you’ll start getting more referrals from search engines once you build a library of articles around a few topics. The more informative your website is, the higher its rank will be. As you piece together valuable content, keyword placement strategy comes into play. Be sure to include keywords in each of the following areas: page titles, URLs, page headers, and body content. Initially, this will help search engines find your content. But keep in mind your website should be optimized for human visitors, not just for search engines. Google takes this into account when it ranks your page. Organizing your site with menus makes it easier for Google to crawl your pages. But in addition to your main navigation, relevant links within your body content will also boost your ranking. Scour your blog posts for topics related to each of your site pages and interlink your blog by connecting related posts. The quickest way to do this is to find phrases in your current posts that you can easily convert to hyperlinks to other posts. On-page links within body paragraphs rank higher than navigation and links in the sidebar, as these are more common locations for spam and ads. For a great read on links, check out this article from Moz. SEO is not a one-time tweak leading to instant results. You have to think of it as an ongoing project that takes time and effort to develop. 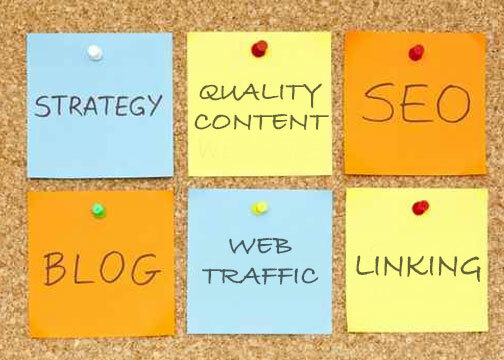 These three major components of SEO strategy each have their own sub strategies. But from a holistic perspective, knowing what good SEO entails should prevent common misconceptions. And having the right expectations helps you assess the value of your marketing efforts honestly and effectively.